Following Tuesday’s fish kill near Rockingham, two new fish events further north in Cockburn Sound are being investigated by officers of the Department of Primary Industries and Regional Development. Fisheries officers have attended Woodman Point, to respond to multiple public reports of erratic fish behaviour, described in public reports as “pilchard type fish leaping out of the water”. The department’s Aquatic Diagnostics pathologists are standing by to receive samples of the fish for laboratory tests. Water samples will be sent to the Department of Water and Environment Regulation’s phytoplankton ecology unit. 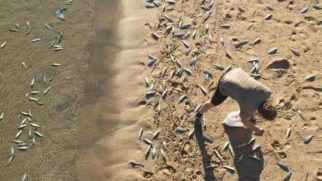 Results from the Rockingham fish kill have not found anything unusual that could be a cause of that earlier event, when approximately 1000 scaly mackerel, which is a small tropical sardine, were observed along Palm Beach up to Rockingham Yacht Club. No other species of fish were observed as part of Tuesday’s investigation. Water sample analysis indicated low levels of phytoplankton, which is unlikely to have caused the fish kill, so additional testing will be carried out to try and determine the cause of the scaly mackerel mortalities. This morning, the department also received reports of starfish mortalities on Challenger Beach in Kwinana and officers who attended saw up to 100 starfish on the beach, from which samples have been collected for analysis. Department of Primary Industries and Regional Development Executive Director for Fisheries and Agriculture Resource Management, Dr Rick Fletcher said with hot weather forecast for the weekend water users needed to be aware of the fish kill events this week. “Fisheries officers will continue to monitor the beaches in case of further fish deaths and any additional species that may be observed,” Mr Harrison said. “We also urge members of the public to be watchful and report any fish kill they see to our special FishWatch reporting line on 1800 815 507. We are currently investigating circumstances around a reported fish kill in Rockingham. Cockburn Sound provides fantastic fishing and is vitally important for many Perth fishers. It disappointing to see large numbers of fish perish like this. A timely response and investigation into fish kills is essential as normal environmental processes mean the window for gathering useful samples closes quickly. We are pleased to learn that DPIRD Biosecurity Compliance Officers have already taken fish and water samples on site. We will keep our community updated as we learn more. FISH KILL NOTIFICATION – Rockingham Foreshore. REPORTED BY: Members of the public and the City of Rockingham to the FishWatch hotline on 06/02/2019. First Report at 7:49am. SPECIES/NUMBER OF ANIMALS INVOLVED IN THE KILL: Over 1000 Scaly Mackerel in an area from Palm Beach Jetty to Rockingham Yacht Club. Later reports have smaller numbers of fish washed up further North towards Naval Base. Fisheries officers attended the site shortly after receiving the report along with officers from City of Rockingham. Fish samples and water samples were taken and submitted to the Aquatic Diagnostic Laboratory and PEU respectively. Fisheries Officers will continue to monitor the situation.